Hallam Amos is "the best left wing in Wales" and should firmly be part of Wales' World Cup plans, says Dragons director of rugby Lyn Jones. 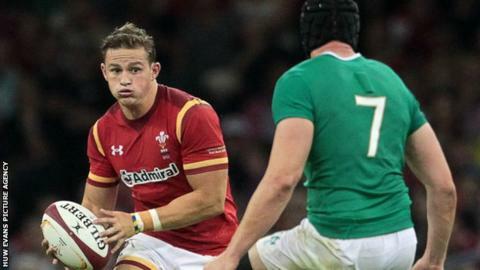 Amos, 20, won his second cap in Wales' recent defeat by Ireland, playing at full-back. His fellow Dragons back, Tyler Morgan, made his debut in that match and Jones believes they are the future for Wales. "I'd be very surprised if they don't make it [to the World Cup]," Jones told BBC Sport Wales. "They are quality rugby players and Hallam is the best left wing in Wales by a mile." Who is Amos up against with Wales? Amos, who has just completed his second year as a medical student at Cardiff University, faces competition from Liam Williams and Eli Walker for the left-wing berth for Wales. Coach Warren Gatland also has the option of playing George North on either flank. The final cut to the World Cup training squad will be made on 31 August, when 31 players will be selected to face Australia, England, Fiji and Uruguay in the pool stage. That final selection will come two days after Wales face Ireland again, this time in Dublin, and Gatland has already suggested he will play a stronger side than the experimental one that was so outplayed in Cardiff. Amos and Morgan could therefore be forced to sit and watch their rivals stake a claim for inclusion, but Jones feels they were among a select few to make an impression in the opening warm-up game. "I thought Hallam and Tyler did themselves a lot of good on a scrappy weekend against Ireland," he said. "I think Tyler is definitely on the bus for me because he can do something different. I'm sure Rob (Howley, Wales backs coach) and the other coaches for Wales would have witnessed that in training, he can do something different and you just need that sometimes." Meanwhile, another international left wing, Aled Brew, is back in action with the Dragons after more than eight months out with back and groin injuries. The 29-year-old played 40 minutes of the region's 48-12 friendly win over Nottingham on Friday night, sharing wing duties with Ashton Hewitt and new recruit Nick Scott in the absence of Amos and Morgan. "It's a massive relief just to get the ball back in my hands and get a couple of runs, it was a perfect start to the season against Nottingham and I enjoyed it," he said. "I just want to play as much rugby as possible and nail down a starting spot." Brew was unable to play after November in the 2014-15 season, after returning from Biarritz for a third spell with the Gwent region. "It was a really tough season with an injury that didn't require an operation, it was just rest and rehab," he added. "It was frustrating but we got there in the end and I'm feeling better than ever. "The Dragons fans have seen me come and go a few times but I'm here to stay now and I won't be going anywhere."